According to archeological evidence, it seems that the earliest humans migrated to the New World in several major waves between 20,000 and 15,000 years ago. Some of these migrants came from north eastern Asia along a maritime route and traveled down the Pacific Coast during the terminal Pleistocene–as early as 12,00 to 13,000 BP in California according to archeological evidence (Erlandson 2008:2232; Faught: 2008: 677; Hall 2004:154; Jackson 2007; Roosevelt 2002:95). The following review will summarize some of the prehistoric material evidence which disproves the long held belief that the Clovis big game hunters were the first Paleoindians to make it to the New World via a terrestrial in-land migration route (the so called “ice free corridor”) from north eastern Asia through Berengia during the Ice Age (ca. 11,000 BP (Balter 2007; Fidel 2004: 95; Turner 2003). The reason why coastal migrations were not accepted earlier is that for the past 70 years it was generally accepted in the archeological community that big game hunters known as the Clovis people were the first humans to populate the New World. Armed with their distinctive bifacial bladed spears, the Clovis were believed to have walked across Berengia from Siberia around 11,500 to 11,000 years ago and were big game specialists (Dillehay 1991:12; Erlandon 2008:2232; Grayson 2003:588; Roosevelt 2002:95). These presumed first Native Americans were identified as “Clovis” due to the distinctive form of their lithic tools and spear points. These lithics are characterized by long slender and bifacial fluted blades and were first discovered in Clovis, New Mexico with the butchered remains of extinct mastodon and mammoth in the early 1930’s by Edgar B. Howard (Bonnichsen 2001:545). Clovis technology is considered a short-lived North American technical horizon that was used by big-game hunting specialists in the Americas ca. 11,300-10,000 BP (Bonnischsen 2001:545). In fact, it is the Clovis who are blamed by some for the Megafauna extinction (the extinction of almost all of the large prehistoric mammals) in North and South America about 10,000 years ago (Tyson 2009). However, as elegant as the Clovis theory is, it has been disproved due to older and differently shaped lithic technologies that have since been discovered in the New World. From archeological evidence of older human settlements found in the New World, the lack of Clovis sites discovered in Alaska, the inhospitable paleoclimate during that time that would of made passage on foot through Berengia impossible. It is these findings as well as the multitude of earlier and contemporaneous non-Clovis technology carrying and generalist terrestrial forager and coastal marine occupations found around along the Pacific Coast from southern Alaska and all the way down to the tip of South America that have since disproved the Clovis theory (Dillehay 1991; Erlandson 2008; Faught: 2008; Hall 2004; Jackson 2007; Roosevelt 2002;Waters 2011). Plus there is only sparce archeological evidence of the early colonization by Clovis people in North America dating to the Late Pleistocene (Faught 2008:686). Recently, a central Alaskan site, along the “ice-free corridor” was discovered dating ca. 11,500 BP but it was not a Clovis occupation (Potter 2011:1061). To get around the lack of archeological evidence of the Clovis people migrating across Berengia during the late Pleistocene, a minority of archeologists believe that they may have entered the New World from Europe five to ten thousand years earlier along an “ice-edge corridor” during the Last Glacial Maximum (Bradley 2004:473). This theory is currently un-substantiated by archeological evidence in the New World. It is based solely on the similarity of the fluted bifaces of the Clovis culture found in the Americas around 11,000 years ago and Upper Palaeolithic Solutrean technologies found on the Iberian peninsula (present-day Spain) that are at least older by 10, 000 years (dating between 22,000 and 16,500BP (Bradley 2004:565). The dearth of archeological evidence that ties the Solutreans of 22,000 in Europe with the Clovis North America 11,000 makes the European migration theory, as yet, still not supported by archeological evidence. What follows are some recent and not-so recent archeological discoveries that indicate plenty of pre-Clovis occupations in the New World and that the first migrants came in successive waves waves during the Late Pleistocene from north east Asia. Some of these migrations were of maritime foragers and who spread relatively quickly through the New World along the Pacific Coast in boats and some were terrestrial foragers who may have come through the interiors of North and South America (Braje 2005; Erlandson 2008, 2011; Gilbert 2008:786; Jones 2002:213; Oakley 1963:141; Rick 2005). PACIFIC COAST OF NORTH AMERICA: The earliest coastal occupations found in Alaska and Canada are early Holocene sites of maritime foragers founds at Ground Hog Bay 2, Hidden Falls and Chuck Lake 2 (Erlandson 2008:2235). Only one site out of 110 coastal sites in the southern Northwest Coast is older than 5000 years and is Oregon and has been dated to about 8,500 BP (Erlandson 2008:2237). Dozens of coastal sites dating between 13,000 to 9,000 BP have been discovered along the central and southern coast of California (Braje 2005; Erlandson 2008:2237; Faught 2008). The earliest evidence of human occupation in California is from “Arlington Man” found at the Arlington Springs site with recent AMS dates close to 13,000 BP (Erlandson 2008:2238). Not all archeologists are in agreement that the first Americans were maritime foragers and there are currently no conclusive pre-Clovis coastal forager sites in California (Erlandson 2008:2237; (Turner 2003:391). Middens and lithics found at several island and mainland sites of Baja California, dating from the Late Pleistocene to Early Holocene indicate presence by maritime foragers as early as 11,800 to 9,100 BP (Erlandson 2008:2242). TEXAS: Archeological evidence of lakeside Paleoindians pre-dating Clovis, dating 13,200 to 15,500 years ago–about 1,000 years before the Clovis big game hunters were in the region, was discovered recently in Buttermilk Creek, Texas (Pringle 2011:1512; Waters 2011:1599). The lithic assemblage does not include the characteristic fluted biface Clovis-style points (Waters 2011:1601). The assemblage provides a possible ancestral technology to the later Clovis fluted biface technologies (Waters 2011:1602). CHILE: There is widespread acceptance of pre-Clovis occupations at Monte Verde, Chile dating 12,500 years ago (14,500 cal. BP) (Erlandson 2008: 2233; Grayeson 2003: 587; Hall 2004:132; Jackson 2007:725; Meltzer 1997:659). The coastal littoral (lakeside) site of Monte Verde contains a megafauna vertebrate faunal assemblage, Clovis-style fluted bifaces, cordage, wood, seeds and other paleoethnobotanical remains (Meltzer 1997:661). Also found in Chile are coastal settlement sites on the Pacific Coast dating during the Late Pleistocene from 13,350 to 12, 880 cal. BP (Jackson 2007:728). BRAZIL: Evidence of pre-Clovis occupation was discovered in a south-facing sandstone rock-shelter in Pedra Furada in northeast Brazil in 1978 (Meltzer 1994). The oldest Pedra Furada phase of the site dates to 14,300 BP (Meltzer 1994: 698). The following Serra Talhada phase is dated to 10,400 BP and is contemporary with the Clovis technology horizon (Meltzer 1994:698). The radiocarbon data from the Pedra Furada phase is widely accepted though there is some dispute that the quartzite stone tools may be naturally made geofacts (Meltzer 1994:709). The evidence of Late Pleistocene/Early Holocene occupations from archaeological sites in the New World are so geographically spread out and have so much cultural and biological diversity that they indicate several migrations extra-Berengia and pre-Clovis (Faught 2008:689). Paleoenvironmental studies as well as genetic studies appear to confirm that there were several major waves of migrations to the New World (Clark 2009:711; Erlandson 2008; Hall 2004:132; Lovegren 2007). By the time the Clovis culture appeared in the New World, there were already maritime foragers along the Pacific Coast, littoral foragers in Chile, riverine foragers in the tropical forests of present-day Brazil, and even generalist foragers serving up southern barbeque in central Texas about 13,200 years ago (Faught 2008: 689; Roosevelt 2002:95;Waters 2011:1599). 2004 The North Atlantic Ice-Edge Corridor: A Possible Palaeolithic Route to the New World. World Archaeology 36(4): 459-478. 2011 Do Island Sites Suggest a Coastal Route to the Americas? Science. 331:1122. 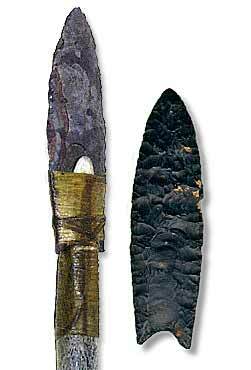 2001 Clovis Blade Technology, Clovis Revisited and Folsom Lithic Technology. Book Reviews. American Anthropologist. 103(2):544-546. 2005 Reassessing Human Settlement on the South Coast of San Miguel Island, California: The use of 14C Dating as a Reconnaissance Tool. RadioCarbon. 47(1):11-19. Clark, Peter U. et al. 2009 The Last Glacial Maximum. Science. 325:710-714. 1991 The Great Debate on the First Americans. Anthropology Today. 7(4):12-13. 2011 Paleoindian Seafaring, Maritime Technologies, and Coastal Foraging on California’s Channel Islands. Science. 331: 1181-1185. 2008 Life on the edge: early maritime cultures of the Pacific Coast of North America. Quatemary Science Reviews 27: 2232-2245. 2008 Archeological Roots of Human Diversity in the New World: A Compilation of Accurate and Precise Radiocarbon Ages from Earliest Sites. American Antiquity 73(4): 670-698. 2004 The Kennewick Follies: “New” theories about the Peopleing of the Americas. Journal of Anthropological Research. 60(1):75-110. 2003 A Requiem for North American Overkill. Journal of Archaeological Science 30(5):585-593. Gilbert, Thomas P. et al. 2008 DNA from Pre-Clovis Human Coprolites in Oregon, North America. Science. 320:786-789. 2004 Pleistocene Migration Routes Into The Americas: Human Biological Adaptations and Environmental Constraints. Evolutionary Anthropology. 13:132-144. 2007 Initial Occupation of the Pacific Coast of Chile during Late Pleistocene Times. Current Anthropology 48(5): 725-731. Jones, Terry L. et al. 2002 The Cross Cree Site (CA-SLO-1797) and Its Implications for New World Colonization. American Antiquity. 67(2): 213-230. 2007 Genetic Analysis of Early Holocene Skeletal Remains From Alaska and its Implications for the Settlement of the Americas. American Journal of Physical Anthropology. 132:605-621. Meltzer, David J. et al. 1997 On the Pleistocene Antiquity of Monte Verde, Southern Chile. American Antiquity. 62(4):659-663. 1994 On the Pleistocene human occupation at Pedra Furada, Brazil. American Antiquity. 68:695-714. 1963 Relative Dating of Arlington Springs Man. Science. 141(3586): 1172. 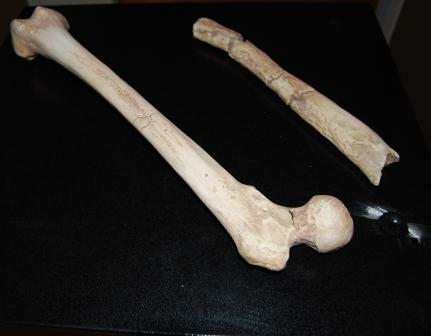 2011 Texas Site Confirms Pre-Clovis Settlement of the Americas. Science. 331:1512. Potter, Ben A. et al. Rick, Torben C. et al. 2005 From Pleistocene Mariners to Complex Hunter-Gatherers: The Archaeology of the California Channel Islands. Journal of World Prehistory. 19:169-228. 2002 Clovis in Context: New Light on the Peopling of the Americas. Human Evolution 17(1-2): 95-112. 2003 Three Ounces of Sea Shells and One Fish Bone Do Not a Coastal Migration Make. American Antiquity 68(2): 391-395. 2003 Clovic Hunting Strategies, or How to Make Out on Plentiful Resources. American Antiquity. 68(2):333-352. 2011 The Buttermilk Creek Complex and the Origins of Clovis at the Debra L. Friedkin Site, Texas. Science 331: 1599-1603. Weaver, Andrew J. et al. 2003 Meltwater Pulse 1A from Antarctica as a Trigger of the Bølling-Allerød Warm Interval. Science. 299: 1709-1713. This entry was posted in American Indians, Archaeology, North America by arkirwin. Bookmark the permalink.